is associate professor of literary and cultural studies at Carnegie Mellon University, where he specializes in early modern literature and thought. He is co-founder, with Daniel Shore, of the Six Degrees of Francis Bacon project, which reconstructs early modern social networks 1500-1700. His most recent book, Literature and the Law of Nations, 1580-1680 (OUP, 2015), was awarded the Roland Bainton Prize for Literature. In 1928 Jacob Levy Moreno, a Vienna-trained psychiatrist who had recently emigrated to New York, developed an innovative way of identifying ‘at risk’ children. He analysed social patterns at the State Training School for Girls and the Riverdale Country School by asking students who their friends were, and charting their answers. The resulting graphs used geometric shapes to represent individuals and lines to indicate friendships: he called them sociograms. Noticing that two particular girls in the graph appeared isolated, he predicted that they would soon run away. They did. Since Moreno, network visualisations have grown ubiquitous, animating everything from the history of film (eg, the parlour game Six Degrees of Kevin Bacon) to the history of philosophy (eg, the site I co-founded, Six Degrees of Francis Bacon). Today’s news editors festoon their reports on the Russia scandal and the Panama Papers with the pervasive lines and arrows of Moreno’s distinctive visual grammar. But is all of this really Moreno’s doing? What might we see if we treat Moreno himself as a node in wider intellectual tradition? What, in other words, is the intellectual history of network visualisation? To do justice to these questions, it helps to consider Moreno’s contributions in an expanded timeframe – one extending to early modern Europe. The esoteric secrets of the Universe had long occupied religious and hermetic thinkers, and the cartographic work of mapping wind currents, sea currents and trade routes – to which Moreno’s work bore comparison in the Times’ metaphors – had already been underway for centuries when Moreno created his sociograms. Looking at Moreno’s visualisations alongside those of earlier thinkers illustrates why Moreno might be remembered not for heroically founding network visualisation but for quietly and successfully translating the imagistic aspirations of natural philosophy into a new iconography of the social. Take the German natural philosopher Athanasius Kircher (1602-1680). 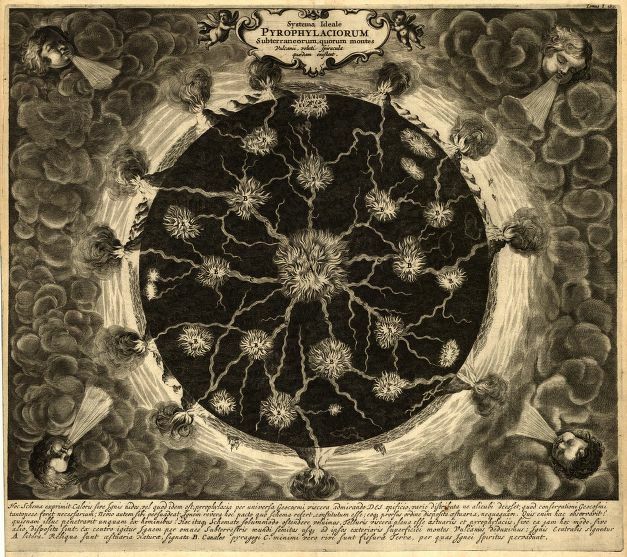 Kircher produced speculative drawings that posited a global system of fiery canals that fed the world’s volcanoes, and diagrams that traced geometrical pathways of echoes through space. Like Moreno 300 years later, Kircher had dedicated his career to developing ‘probable imitation[s] of Nature’s secret realms and forces’, and, it is said, ‘could not think except in images’. Kircher’s most influential work was called Mundus Subterraneus (1665), or Underground World. In the 18th- and 19th-centuries, cartographers dedicated themselves to mapping the invisible forces behind travel, trade and capitalism. For instance, there was apparently some hidden force that facilitated northeasterly travel between North America and Europe, and penalised North-Atlantic journeys toward the global south. But what was it, and how did it work? It was Benjamin Franklin (1706-1790) who identified a ‘river in the ocean’ that strengthened associations between some places and weakened those between others. He called it the Gulf Stream. The map that he produced with his cousin Timothy Folger revealed the true forces of association. 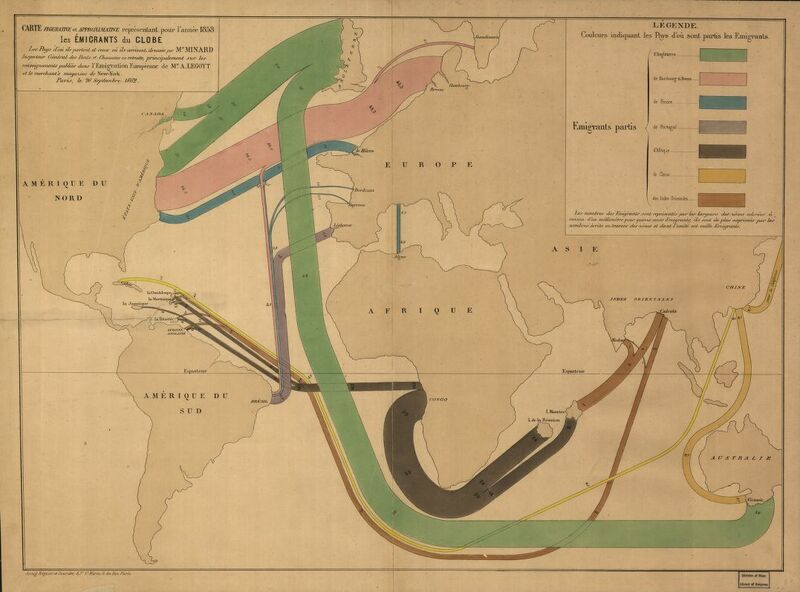 The American natural scientist Matthew Fontaine Maury (1806-1873), for his part, produced revelatory maps of global trade winds derived from centuries of shipping data that at last allowed mariners to understand the hidden system of invisible forces to which they’d long been subject. The lines of arrows on his maps gave Maury the aura of a new Prometheus. According to one admirer writing in 1918, he was the ‘genius who first snatched from oceans and atmosphere the secret of their laws’. Another of Moreno’s forebears was the French cartographer Charles Joseph Minard (1781-1870). What Franklin and Maury had done for hydrography and aerography, Minard did for political economy. The subjective experience of industrial-age capitalism was bewildering – creating ‘everlasting uncertainty and agitation’ according to The Communist Manifesto of Karl Marx and Friedrich Engels – but Minard’s visualisations revealed the global flows of migrants and commodities whose scale eluded raw human perception. Moreno adapted these traditions. To the hidden systems of fire, wind, water and capital, Moreno added tele, ‘the socio-gravitational factor which operates between individuals’. Deriving tele from the Greek for distance (τῆλε), Moreno made legible the various distances, affectively speaking, in a given ‘social atom’. To consider Moreno’s sociograms in this tradition is to appreciate the extensive iconography of natural philosophy behind Moreno’s network visualisations. And his images illustrating otherwise imperceptible flows of social energy teach us another critical lesson about the intellectual history of network visualisations as well: that every network visualisation is both a boundary that marks the limits of human perception and an invitation into numinous secrets beyond the phenomenal world. Seen historically, network visualisations testify to what’s been possible or permissible to know. Moreno’s ideas about subterranean social currents found their fullest expressions in his work on psychodrama, a playacting therapeutic technique. Through these channels, his static, two-dimensional sociograms achieved dynamic, 3D life. By encouraging groups to perform the roles of partners, family members and other relations on stage, Moreno felt that he was creating something akin to living sociograms. In improvised performances, ‘the emotional currents which fill the social atom are reenacted … and made alive,’ he wrote, and ‘the whole past is moved out of its coffin and arrives at a moment’s call.’ Central to these performances was Moreno’s impassioned commitment to spontaneity, in particular the idea that spontaneous improvisation could liberate people from static, clichéd scripts that trapped them in unhealthy emotional configurations. Indeed, commentators have seen Moreno’s influence in the career of the so-called mother of improv comedy, Viola Spolin, the American acting coach perhaps best known in theatre circles for her influential book, Improvisation for the Theater (1963). Improv is vaunted for its liberatory ‘yes, and’ ethos, and there’s an important connection between the appreciation of that ethos and for network visualisations. Improv as tonic promises its practitioners something very similar: entrée into a hidden, more authentic realm of connectivity. Ultimately, improv shares with network visualisation the larger project of bringing the indiscernible secrets of nature – human nature – into view. If improvisational theatre, as Moreno put it, was ‘psychotherapy for fallen gods’, then its intent was to unleash the secret, semi-divine forces of collective creativity locked under the surface of the social. Playful collaboration is, after all, its own kind of alchemy. Improv is now said to ease everything from anxiety to autism. As the design theorist Manuel Lima wrote in 2014, network visualisation is ‘the cartography of the indiscernible’. From Kircher to Spolin, its intellectual history is populated by people seeking access to something more systematic, something more meaningful beyond what’s visible here and now. It’s a history linked at once to the scientific project of demystifying the Universe, and also the theological project of gesturing to the great beyond. Network visualisation is keenly aware of humanity’s cognitive limitations, but restlessly so, and driven to search for secrets, holy and otherwise. Wary of priestcraft, it is equally driven to distribute its knowledge beyond authorised bounds. In the arts, its history can be seen in theatre’s attempts to break down the fourth wall, to de-throne scripts and authors. In the sciences, it reveals truths about data that scientists couldn’t otherwise see. 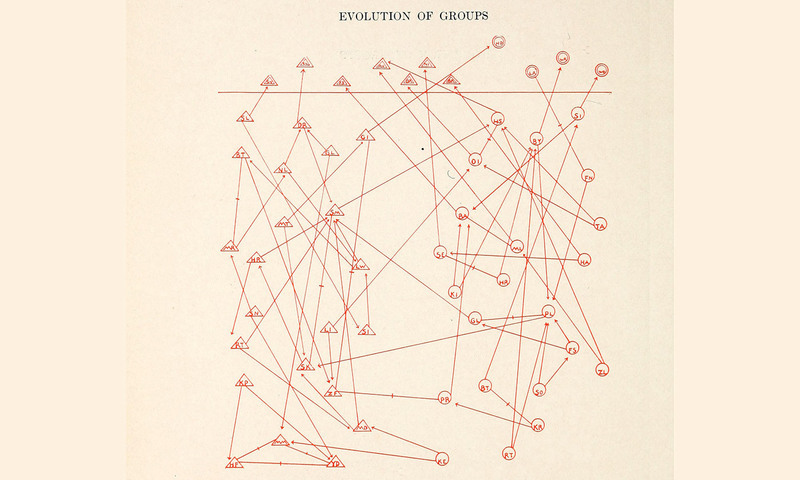 What then is the intellectual history of network visualisation? It is the quest for secret relational knowledge, and the hubris and humility bound up in its search.